2. Submerge chicken in liquid (stock or water) that is just below boiling point, then cook at the barest simmer, for 10-15 mins. Aromatics like whole peppercorns, a clove-studded onion, celery, carrots, or fresh herbs can be added to the water or broth for additional flavour. 3. When cooked pull the chicken apart with a knife and fork, mix with chives and mayonnaise and add salt and pepper to taste. 4. Toast your roll (or favourite bread). When bread is toasted add in the chicken mix. 5. 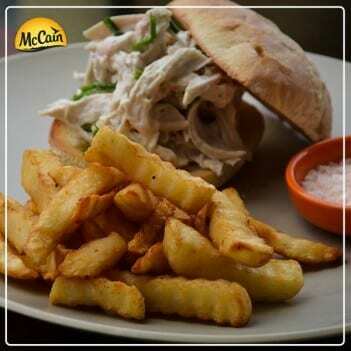 Serve chicken sandwich with McCain Crinkle Cut Fries, heated as per the directions on the packaging, and enjoy! 2 Submerge chicken in liquid (stock or water) that is just below boiling point, then cook at the barest simmer, for 10-15 mins. Aromatics like whole peppercorns, a clove-studded onion, celery, carrots, or fresh herbs can be added to the water or broth for additional flavour. 3 When cooked pull the chicken apart with a knife and fork, mix with chives and mayonnaise and add salt and pepper to taste. 4 Toast your roll (or favourite bread). When bread is toasted add in the chicken mix. 5 Serve chicken sandwich with McCain Crinkle Cut Fries, heated as per the directions on the packaging, and enjoy!